Crown Prince Natural Albacore Tuna, Regular & No Salt, 5 & 12 oz. 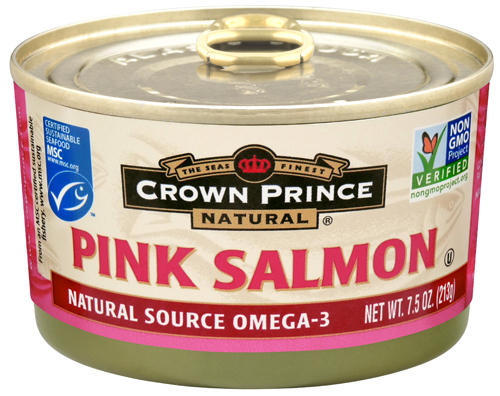 Crown Prince Natural Pink Salmon is now Non-GMO Project Verified! Visit www.nongmoproject.org for further information. Genetic Modification is a special set of technologies that alter the genetic makeup of organisms such as animals, plants or bacteria. While some genetic modification has been done in the aquaculture business, the vast majority of fish available to the American public has not been genetically modified. Inherently, wild caught fish are free from genetic modification. Since all of Crown Prince’s fish are wild caught, there is no danger that there are any GMOs in our products. The Crown Prince Natural line includes two cultivated shellfish – clams and oysters, but these have not been genetically modified. These shellfish feed from the waters in which they grow; therefore there is no danger that they have been adulterated by GE feed. Crown Prince packs our products in simple packing mediums with simple seasonings, none of which contain GMOs. Crown Prince is proud of providing simple, whole foods to our American consumers. Canned fish is not a manufactured product, but is wild harvested from the oceans of our planet. Our customers can be assured that Crown Prince only offers the best that the oceans can provide – unadulterated by genetic modification. Crown Prince feels strongly that consumers have the right to know how their food has been created; this is the basis of the company’s support of Non-GMO Project verification.